The Hotel Victoria 4 is a 3 star hotel aimed exclusively at the convenience of the customer, made exclusively to feel at home in Madrid . Our hotel in central Madrid is a fully restored 1850 building, that has preserved original features and has mixed them with the latest technology and cutting edge design. 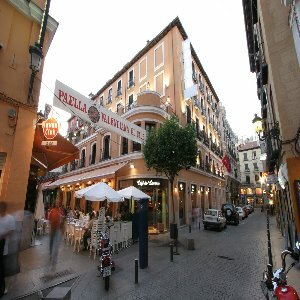 The Hotel Victoria 4 is in the commercial and tourist center of Madrid, near Puerta del Sol and very close to the Paseo del Arte ?, known for its numerous museums, palaces, gardens and fountains. Among the notable buildings are the Casa de Correos in Puerta del Sol, Plaza Mayor and the Palacio Real.